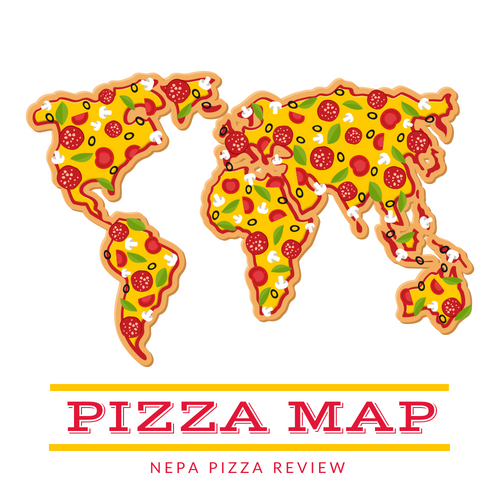 For those of you who follow me on Twitter, you might have seen my announcement that this pizza review marks the one year anniversary of my launching of the NEPA Pizza Review. I have to take a moment to thank all of you have read my reviews, made comments (both positive and negative! ), and follow and interact with me on Twitter, Facebook, Instagram, Google+, and Pinterest. It’s been a great year because of you – and you are what makes traveling all over NEPA buying pizza and expanding my waistline worth it! So thank you!!! To celebrate my one year anniversary, my girlfriend (affectionately known on this blog as “the first lady”) so graciously decided that she would take me out for dinner to celebrate. 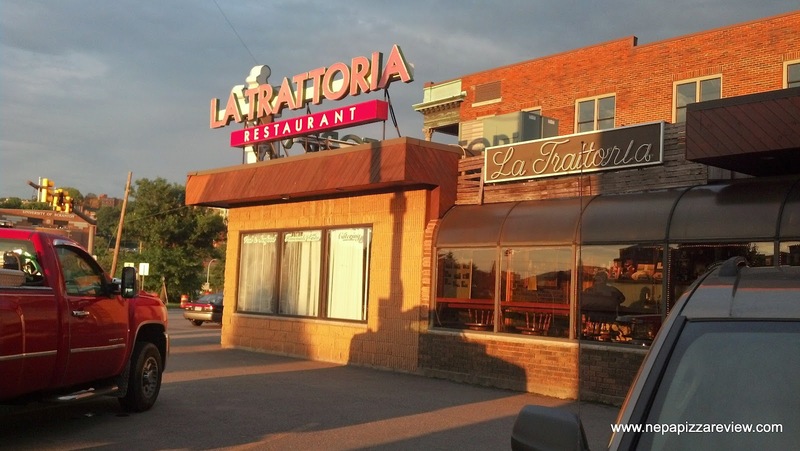 Of course, pizza was on the menu, and she let me choose a special place that I’ve been dying to try – La Trattoria in Scranton! 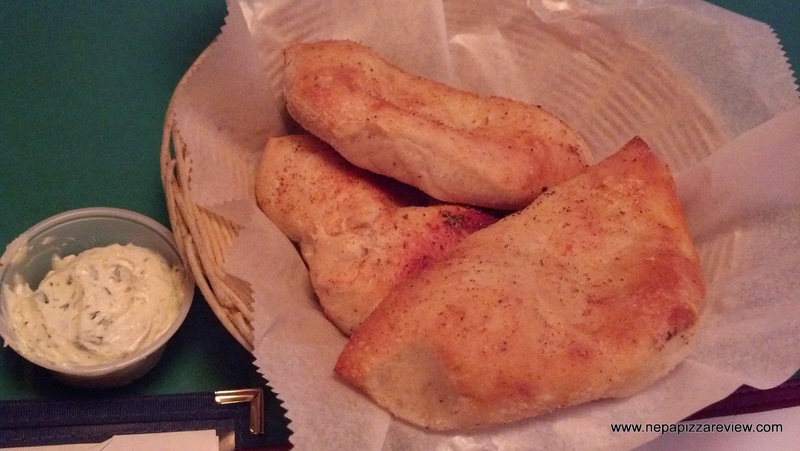 I’ve received numerous emails suggesting that I try out their wood-fired pizza, and I knew that we could also get a delicious Italian dinner to accompany the pizza. During the drive to Scranton, I reflected on all of the pizzas both good and bad that I’ve tried over the course of a year – 84 pizza reviews, hundreds of slices of pizza consumed, and my 25 day pizza streak. I got to thinking, “wow, I put a lot into this website!” This motivated me to get right back to work and start churning out more reviews for the people of NEPA. We arrived at La Trattoria and sat down in the comfortable dining room, which sort of reminded us of an Italian diner – classy yet casual (if that makes sense). It was a really relaxing environment to dine in. We immediately took notice of how courteous and well trained the staff was. The service was extraordinary, and was especially evident when we placed our order for a Neopolitan pizza, and the waitress let us know that the Neopolitan would take approximately 25 minutes to make. I appreciated the heads up, and we proceeded with ordering the pizza anyway. While waiting for the pizza, the first lady and I feasted on some wood-fired oven bread which we dipped in the butter mixed with garlic and herbs. The bread alone made this worth the trip! 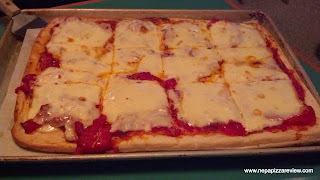 After about 20 minutes, the Neopolitan pizza was ready, and surprisingly enough, the pizza was rectangular - or as we in NEPA call it: "square." This was unique, and the pizzas appearance was like nothing I'd tried before. It was constructed on a relatively thin, flaky crust similar to an old forge pizza, covered with a thick crushed whole peeled tomato sauce, and a thick layer of what appeared to be slices of American cheese. 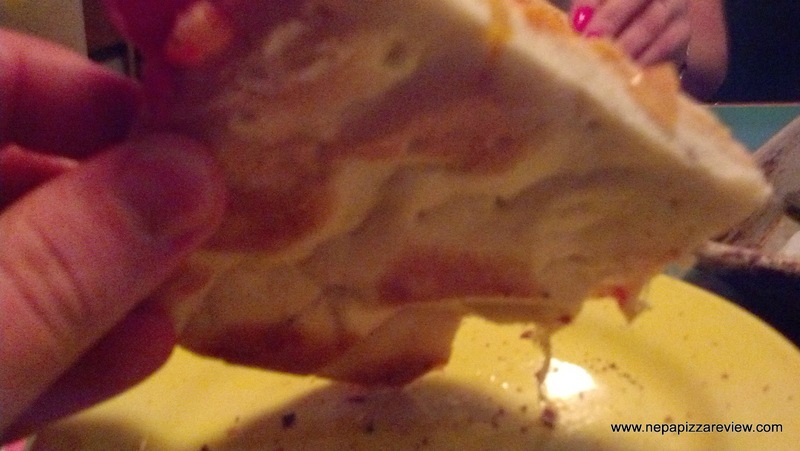 The pie was bellowing steam from beneath the cheese and I couldn't wait to dive right in. The first lady and I grabbed our first slices and both scalded the roofs of our mouths - a consequence of getting overly excited about pizza! I wasn't quite sure if this pizza was cooked in the wood fired oven, because of the length of cooking time, and the lack of wood-fired flavor, but in no way did that take away from this pizza. The crust has to be in the top 2 or 3 for Old Forge pizza crusts that I've tried in this area. It was crispy, flaky, golden brown and simply delicious. I tasted a little olive oil which really made the flavors pop. If you couldn't tell, I was truly impressed with the crust, but that wasn't my favorite part of the pizza - the sauce was. The sauce was comprised of coarsely crushed (I'd assume hand squeezed) whole peeled tomatoes. There were some pieces of tomato that were as big as half a golf ball, which I loved. I like a nice hearty sauce with bigger chunks of tomato, and La Trattoria definitely delivered the goods here. The sweetness of the sauce was derived from the sweetness of the high quality tomatoes, and I don't think any sugar was added. There were some herbs and spices added which made this sauce perfectly balanced and absolutely incredible. Now the cheese was definitely the most unique part of the pizza. As I said, it looked like slices of American cheese on top, but I could not be sure because it was so smooth and not burned. Instead of speculating, I asked the waitress what cheeses were on the pizza. She was kind enough to ask the chef who let me know it was a blend of American and muenster cheeses. To my knowledge, this was the first time I ran into this combination of cheese. It looked as if the cheese was put on top mid-way through the cooking process because it was very light and creamy. I'll be honest, the slices of cheese looked a bit out of place to me, but as I tried it I definitely enjoyed the flavor. The texture was a little strange, but again, I did enjoy the unique blend. The first lady was a huge fan of the cheese, but I felt it was a little out of place given the high quality crust and cheese. 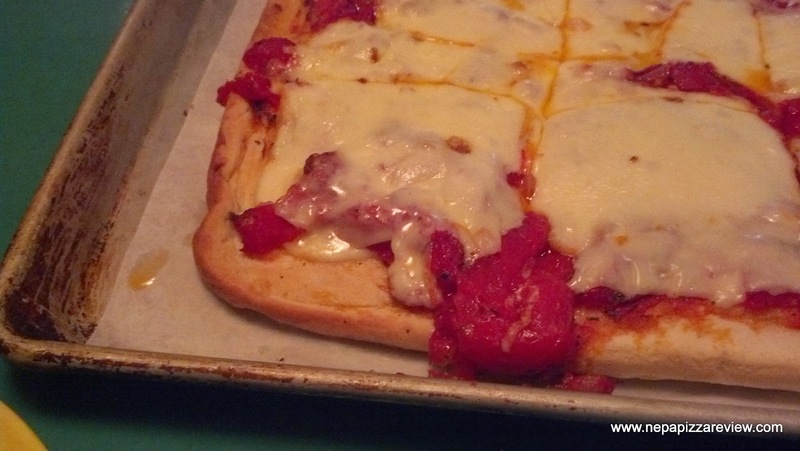 I wasn't so sure about putting processed cheeses in slice form on top of first class dough an tomatoes. In any event, I can't say it was bad, but I would have preferred a fresh mozzarella on this pie and I think it would have suited my tastes perfectly. Regardless of my simple hang-up with the cheese, I think this was a truly unique and fantastic pizza that I recommend you try! 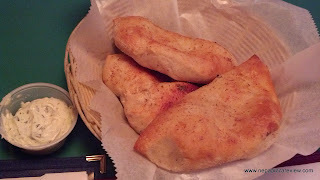 I must also add that the entrees that we ordered were amazing as well, although the portions were huge and we could not even finish a quarter of our meals after sampling the pizza. La Trattoria provides a "leave full" guarantee where if you aren't full, they will give you free seconds on the pasta that you ordered. Just another great reason to visit "La Tratt." 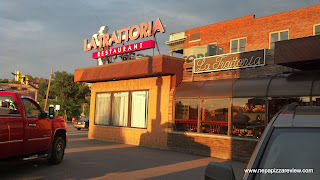 So thank you again for all of your support, and my gift to you is my suggestion to try La Trattoria in Scranton! Let me know what you think!